The Multi-Vitamin + Antioxidants Ultra Riche PM Treatment** from 100% Pure provides a boost of nutrients to damaged or ageing skin. This blend contains potent ingredients such as Aloe Vera, Rosehip Oil, Green Tea and CoQ10 along with Vitamins A*, C and E which work to combat skin damage. CoQ10 is believed to target skin damage and may help stimulate collagen production while Vitamin A is included to help increase skin cell regeneration. 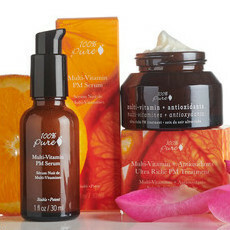 Rosehip Oil is rich in Omega-3, 6 and 9 Fatty Acids to help promote a youthful appearance. 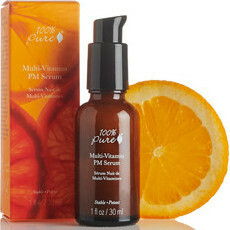 This moisturiser can also be used in conjunction with the 100% Pure Multi-Vitamin + Antioxidants Potent PM Serum. Also available in special discounted 100% Pure Skin Care Packs for Mature Skin or Normal to Dry Skin, ideal if you would like to purchase this as part of a daily skin care regime. Please note this new batch of stock is the original formula and is not vegan. The new vegan formulation will be back in stock when our new shipment arrives. Stock up if you loved the original balm-like product! Please also note that this product compared to the last batch may appear underfilled, when in fact the previous batch was very overfilled! The vendor has calibrated the filling machine and we can confirm that these jars are filled to advertised weight. Made in California. Cruelty-free. Packaged in glass. *This formula is recommended for night time use only: High percentage of active ingredients is too potent for daytime use. Avoid in pregnancy. 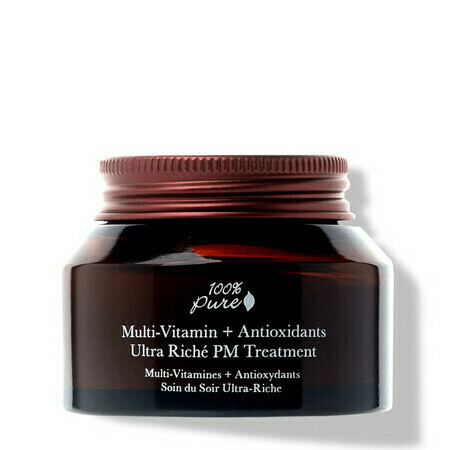 Aloe Vera, Green Tea, Vitamin A, Vitamin E.
Apply a small amount to clean skin on the face and neck in the evening. 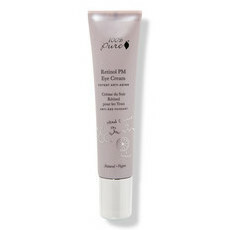 Dot around the face and evenly distribute using a gentle circular motion. I have been using this product for a few days now. I noticed the velvet like appearance of my skin right away, but didn’t think much of it. It’s not until other people started commenting on how wonderful my skin looks like that I connected the dots. My hubby did a bit of an interrogation last night asking what changed and how supple my skin looks. So at night I had a nightmare that I run out of it. So what do you think? I am up at 3:30am ordering two more of this gem. Some comments said that this original formula is much better than the new one, so I decided to stock up while it’s there!! The new formula has nothing on the old. The consistency is much lighter and less hydrating. It leaves a sticky residue and smells like carrot soup. It stings my sensitive skin and I don’t wake up with a glow like with the old formula. Disappointing when they mess with a good thing. Feels beautiful, smells wonderful, my new favorite.